The ABC’s acting managing director discussed a redundancy package and leaving the public broadcaster just months before he was promoted to the top job. 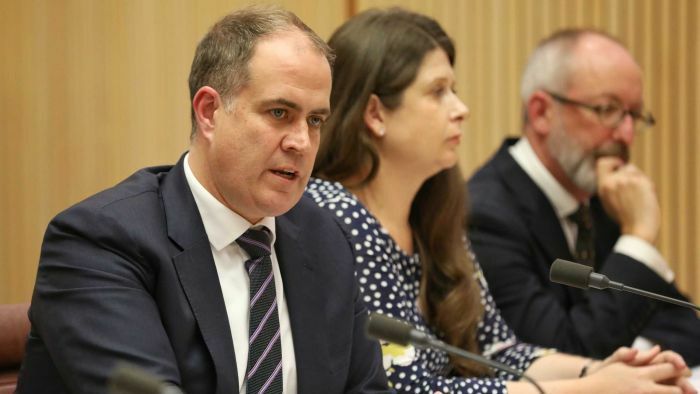 David Anderson took on the role after the ABC board sacked former managing director Michelle Guthrie halfway through her term, triggering weeks of controversy and government reviews. Mr Anderson earlier this month said he wanted to stay in the managing director role long-term. Mr Anderson has told a Senate Estimates hearing he was surprised when Ms Guthrie was dismissed, describing it as “extraordinary”. He also revealed the senior management team did not raise concerns about Ms Guthrie’s performance. Publicly stated reasons for Ms Guthrie’s dismissal included her leadership style and relationship with the Federal Government. After questions from Liberal senator Eric Abetz, Mr Anderson confirmed he considered a redundancy with Ms Guthrie as part of a broader discussion about his career prospects. “I have had discussions with what was my former managing director a number of times over the course of the year about my career, and redundancy did come up in the conversation a few months back,” Mr Anderson said. Senator Abetz asked whether that meant his position at the time — director of entertainment and specialist — would need to be abolished. “It was a broad-ranging discussion and I agree with you; a true redundancy would mean that a position would need to be substantially changed or abolished,” Mr Anderson said. In a statement, Senator Abetz said it appeared Mr Anderson “sought to game the system to get a redundancy where no redundancy would have existed”. “This is extremely troubling and inappropriate conduct which brings into question Mr Anderson’s judgement and fitness to continue in the substantiative managing director’s role,” Senator Abetz said. But Mr Anderson said he did not recall who first brought up the option of a redundancy. “I remember having a discussion that lasted for some time with my former boss, of which a redundancy came up,” Mr Anderson said. “Only my boss and I know about that conversation … we moved on from the redundancy conversation pretty quickly. Further ABC comment has been sought. Mr Anderson also revealed former ABC chairman Justin Milne raised concerns about another comedy show with senior management. Last month, it was reported Mr Milne wanted editorial policies changed in response to a skit on the program Tonightly that was full of swear words. Mr Anderson said he also raised concerns about language used in the show Black Comedy. “We had two instances of the use of one particular word, which Senator I don’t wish to use at the moment, that came up about the same time,” he said. Mr Milne resigned as chairman after accusations he interfered in the broadcaster’s editorial independence.